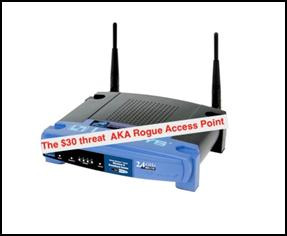 A rogue AP is an access point that is not configured or supposed to be on your school network, the problem is that if you don’t offer your own secure wireless at school chances are you have quite a few on campus that is are out of your control. Here’s something to note, 90% of the time Rogue AP’s are placed on a campus network without malicious intent- it’s done by users that don’t have it otherwise. Many teachers have limited technology and resources in the classroom today. Some well-intentioned teachers will even buy their own technology in the classroom (which is very respectable). The most common Rogue AP’s we see on campus are the teachers who want to use their laptop to show a video or use multimedia in class. But when this happens, The school’s network is now being blasted outside into the parking lot for anyone to use and potentially exploit. And depending on your network architecture, you may have just lost control of WHO is connecting, HOW they are connecting, and WHAT access they have. Our recommendation (of course) is that schools today place a priority on providing multimedia grade wireless access for their students and teachers. Having secure wireless access is the best way to prevent unauthorized wireless networks. Have a question about wireless networking or wireless security for schools? Feel free to contact us or comment below.